Fearful that her ailing father will be drafted into the Chinese military, Mulan (Ming-Na Wen) takes his spot — though, as a girl living under a patriarchal regime, she is technically unqualified to serve. She cleverly impersonates a man and goes off to train with fellow recruits. Accompanied by her dragon, Mushu (Eddie Murphy), she uses her smarts to help ward off a Hun invasion, falling in love with a dashing captain along the way. ‘Mulan’ has always been one of those movies I enjoyed watching but didn’t really love. I lumped it in with other [personal] Disney disappointments like ‘The Little Mermaid’ and ‘Pocahontas’. But last night I watched it and, well, I kind of adored it. And now I don’t get why it isn’t more popular! I can’t get over how much I liked Sheng on this rewatch! He’s such a well-developed character. He wants his father’s approval, he wants to protect his troops, he wants to understand this weird guy, Ping. You can almost see the conflict in his mind when he’s supposed to execute Mulan – loyalty to his country’s laws or loyalty to what he knows is right? Mushu still irks me at times, but he can be legitimately funny. And he’s not half as annoying as Olaf, so that’s a definite plus. The themes in ‘Mulan’ – loyalty, family, doing one’s duty – all strike a chord in me. Now, more so than ever. Which is probably why I like it so much. 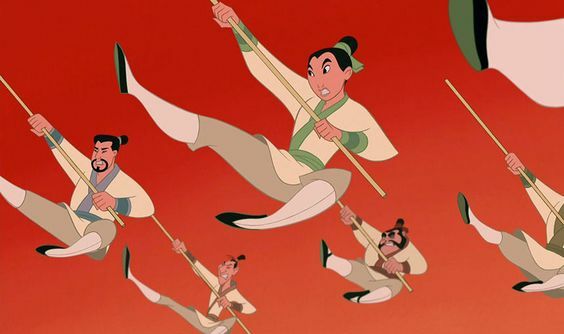 There are moments of humor throughout ‘Mulan’ but I think it’s Disney’s most grown-up princess movie. It’s also one of the most underrated. 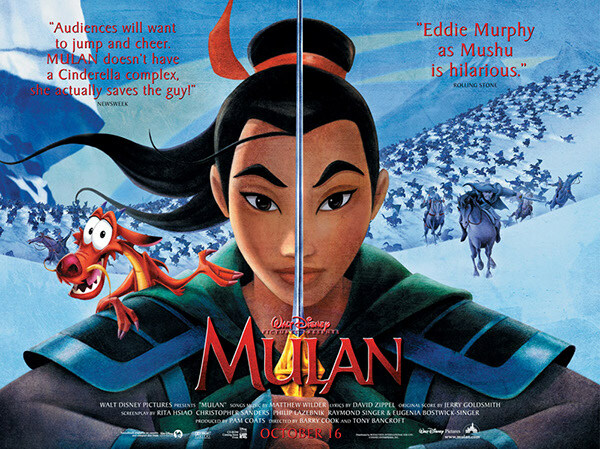 If you don’t enjoy ‘Mulan’ and haven’t seen it in a while, I highly suggest you give it another try. You might be pleasantly surprised. Have you watched ‘Mulan’? What do you think of it? I have somewhat mixed feelings about Mulan. I did find the dramatic irony with Sheng to be somewhat flat. But what made up for me was Mushu, the songs, and scenes with Mulan and her father. 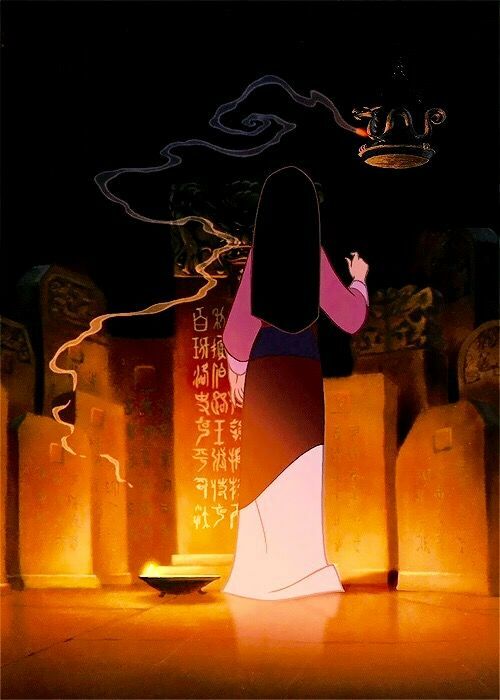 I have had plenty of memories of Mulan. Fun fact: “True to Your Heart” was the first song from Stevie Wonder I have heard. 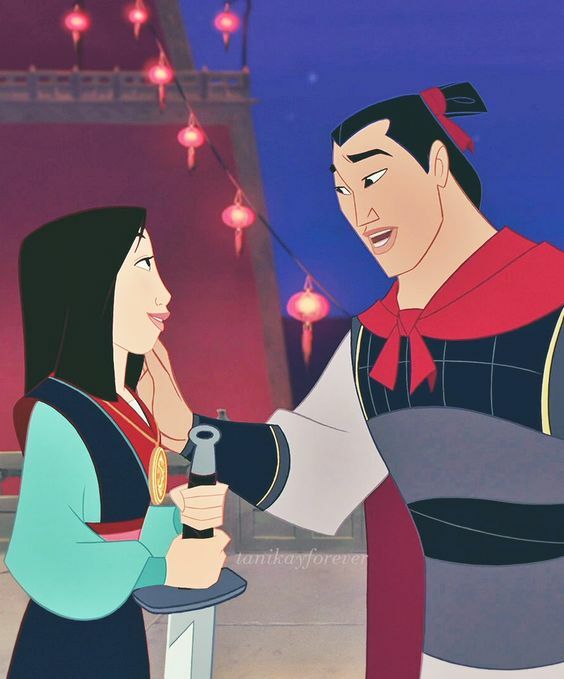 The scenes with Mulan and her father are definitely the most touching in the whole film. Someone once commented that the transition from ‘A Girl Worth Fighting For’ to the burned village was the most severe mood whiplash in any movie. I tend to agree. The first Stevie Wonder song I heard was ‘Stay Gold’ from The Outsiders. I love Mulan so much; it’s been one of my favorite Disney movies for a long time! The only parts I DON’T like are the scenes with the Ancestors…and yet I re-watched them as an adult and their dialogue *was* hilarious XD Still, definitely on the weird side. Other than that, such a wonderful yet underrated film. Yeah, the concept of the Ancestors is weird – but they are really funny. Not something I’d want my little bros seeing though – until they’re older, anyway. I’m glad you enjoy this movie! And the music in this one is FABULOUS. This is one of the few films where I actually paid attention to the instrumental score! Remember the hair-cutting scene??? Chills, people! Wow, you noticed the score! It’s pretty incredible.
. . . how dare they disrespect Eddie Murphy like that???? The only thing that holds this movie back for me is Mushu. He’s mildly funny at best, and more often than not a distraction that makes the movie less effective in tone. Apart from that, Disney’s Mulan is really good. It also feels more culturally respectful than Pocahontas, even if there are a couple of song lyrics early on that are a bit iffy. Yep, I think Mulan is definitely more respectful of Asian culture than Pocahontas is of Native American culture. Which is nice. I’ve seen it several times, but those were all back in college. It was okay — I also lump it with Pocahontas and Little Mermaid in the “I don’t need to see this again, thanks” category.